"In sympathy, love and prayers to the family." "Mr Brickens was my patient when I worked at NPHCC he was a..."
"Mr. Brickens was my study hall teacher at Lee High School..."
"Please accept my condolences and prayer. 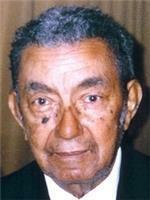 May God give you..."
263 Eddie Robinson Sr. Dr.
Olides Walter Brickens Sr., 102, passed away peacefully on February 3. He was born on February 28, 1916, in Baton Rouge, the son of Walter Brickens and Alice Bell. Mr. Brickens was a 1932 graduate of McKinley High School, he earned the Bachelor of Science degree from Leland College in Baker, Louisiana in 1941, and later did further study at LSU. Mr. Brickens married Sarah Beauchamp in 1944, a union that lasted until her death in 1998. Several years later, he married his current wife, Edna Mencer. After graduating from college, Mr. Brickens began his career in education as a science teacher in Kentwood. Later, he transferred to East Baton Rouge Parish Schools and was assigned a position teaching biology at his alma mater, McKinley. In 1970, he became one of the first African-American teachers at Lee High School. Mr. Brickens retired as a full-time teacher in 1973 and was quite active as a substitute teacher here in the city up until age 94. He was preceded in death by his parents; his wife, Sarah; two sons, Olides Brickens Jr., and O'Dell Brickens Sr.; and a daughter, Alice Brickens. He leaves to mourn his passing: his wife, Edna; sons, Nathaniel Brickens (Deborah) and Charles Hulbert (Mary Elizabeth); and numerous other relatives and friends. A Celebration of Life Service will be held at 11:00am, Monday, February 11, 2019, at Charity Christian Church, 871 O'Neal Lane, Baton Rouge. Interment at Winfield Cemetery. Following the burial, there will be a reception held at the church.